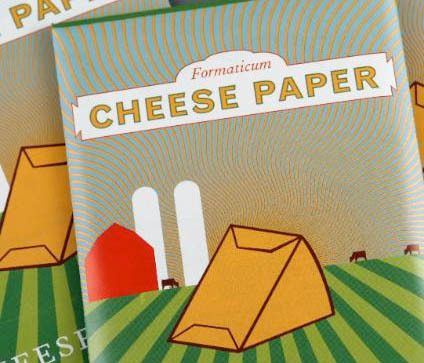 With Formaticum's Cheese Papers, you can wrap your cheese just like a cheesemonger. The coated two-ply papers allow cheese to breathe, unlike non-porous plastic wrap which can speed deterioration. The white sheets are printed with a map of U.S. cheese producers. A package of 15 11x14 sheets, plus 15 adhesive labels, is $7.50 at formaticum.com. "Top Chef" Fact Check: Are Spherical Olives New American? You may have been surprised as I was when Fabio's dish of beef carpaccio with "spherical" olives was crowned the winner of last week's "Top Chef" elimination challenge. I was particularly puzzled at how the olives, created with a technique borrowed from avant garde chef Ferran Adria, could even meet the competition's basic requirement -- to prepare a lunch menu of "New American" dishes. Impeccably sourced California olives brined in small batches from an American artisanal purveyor, sure! But, a concoction of olive puree and alginate to form jelly-coated balls -- huh? I don't doubt that Fabio's dish was the best tasting of the competition. But, if this was New American cuisine, what does New American mean anyway? Let's say you like the idea of Nyotaimori (the practice of eating sushi off of a naked body), but you find the whole situation socially awkward, icky, and unsafe. You may be in the market for Bodylicious X -- contoured, inanimate sushi platters sculpted to look like naked flesh. The trays, available in female and male versions, are €45 each (though you'll need three to form a complete torso) at DesignCode. 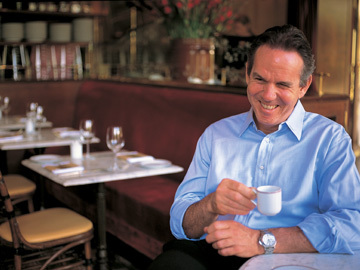 Astor Center (399 Lafayette Street) presents, "Under Pressure: An Evening with Thomas Keller." The event is a celebration of Mr. Keller's newest book and will include an intimate conversation with co-author Michael Ruhlmann. Together they will discuss the unique methods used in the kitchens of French Laundry and per se. "Under Pressure" will take place in The Gallery on Saturday, November 22nd from 6:30 p.m. to 8:30 p.m. Tickets: $125/person. 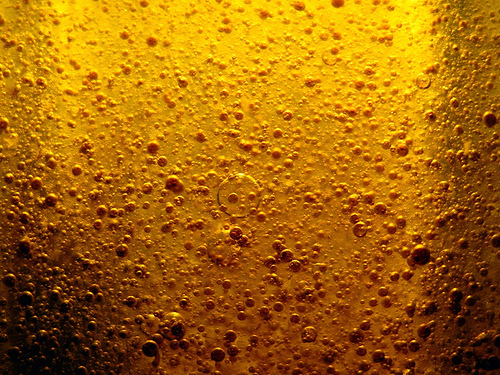 "For the first time I appreciated the strategic importance of the sesame oil–salt dip—not just because it tasted good, which it did, but because the suckers on the tentacles are still fully functional, and the coating of slippery oil prevents them from maintaining their death grip on your tongue." In the Los Angeles Times, Russ Parsons shares a turkey cooking technique inspired by Judy Rodgers, the chef/owner of San Francisco's Zuni Cafe. He calls it "dry-brining": "You just salt the turkey a few days in advance, give it a brisk massage every so often to redistribute the salt, and then roast it." 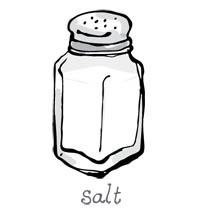 The salt releases moisture from the turkey, which gets reabsorbed by the meat, essentially brining the bird in its own juices. While wet-brining -- soaking the turkey in a saltwater solution -- has become a very popular way of preparing turkey, Parsons notes the technique often leads to a spongy texture. On the other hand, dry-brining leaves the turkey "firm and meaty." 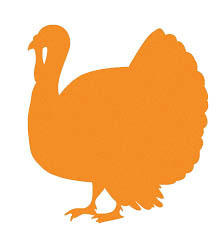 While the technique is straightforward, make sure you leave enough time for the turkey to brine (three days), though Parsons writes that you can cut it back to two days. With Thanksgiving only a few short weeks away (Thursday, November 27th, if you need a reminder), now is the perfect time to plan your dinner...reservation. If you're looking to skip entertaining at home, here are some pre-fixe dining options being offered around New York City. Seating available from 2:00 p.m. to 10:00 p.m.
"Top Chef" Fact Check: Is a Vinaigrette an Emulsion? If you tuned into the premiere episode of season five of "Top Chef" last week, you may have witnessed a moment that seemed to capture the (entertaining) absurdity of turning cuisine into fodder for a reality show: A curious argument broke out between Stefan, the smug, Finnish-born, German-raised caterer, and Danny, the Long Island-based chef and resident New Yawker, over whether or not a vinaigrette is an emulsion. 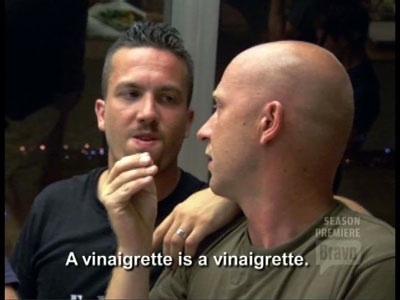 STEFAN: A vinaigrette is a vinaigrette. DANNY: It's an emulsion. The technique of making vinaigrette is an emulsion. STEFAN: A vinaigrette is not an emulsion. STEFAN: Come on! Get a life! So, is a vinaigrette an emulsion? 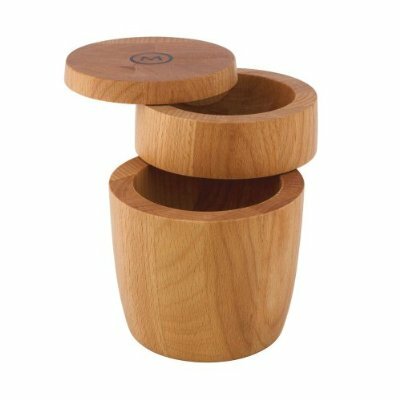 Here's a smart idea: Mario Batali's countertop salt cellar has two individual compartments, so you can keep your Kosher salt and your Maldon sea salt within easy reach while you're cooking. The barrel-shaped solid wood container is quite big (and heavy), so be forewarned if you happen to be short on counter space. $19.99 at Target. "I'm waiting for the day when I can order a morel hot dog at a high school football game; that would be the ultimate fall treat."